Nexera X2 autosamplers support ultrafast injections to increase analytical throughput. In particular, the SIL-30ACMP achieves a 7-second injection time and a 14-second cycle time, making it ideally suited for ultrafast analysis. The Nexera X2 autosamplers, SIL-30AC and SIL-30ACMP, provide near-zero carryover. The improved design maintains a low carryover level, even during long-term usage, to ensure reliable analysis. 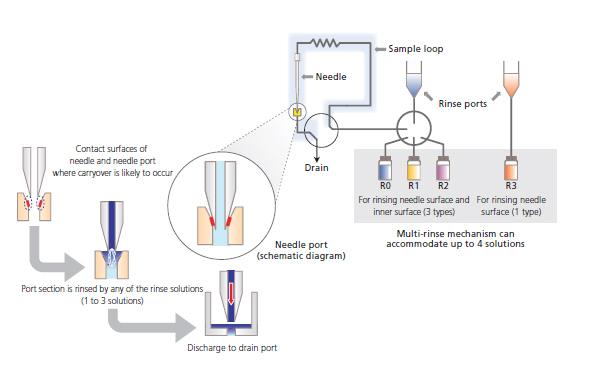 Both the SIL-30AC and SIL-30ACMP support the use of multiple rinse solvents for rinsing the needle’s outer surface and inner surface to thoroughly minimize carryover.